More than 100 college and high school students from nine states honed their cyber defense skills against experts at the U.S. Department of Energy’s (DOE) Argonne National Laboratory during Argonne’s second annual Collegiate Cyber Defense Competition. 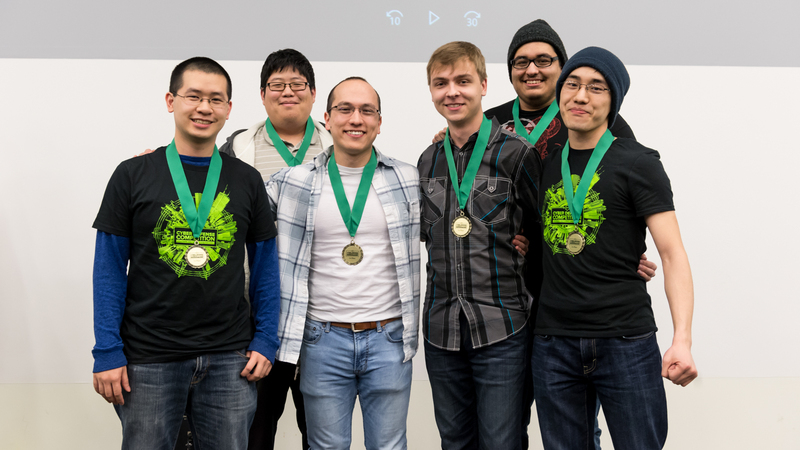 Keeping cyber attackers at bay, the team from the University of Illinois at Chicago won Argonne’s second annual Collegiate Cyber Defense Competition. In the competition, 15 college teams defended mock electrical and water utilities from the repeated cyber attacks of a team of experts from Argonne, the Illinois and Wisconsin National Guard and the technology industry. Devon Streit, U.S. Department of Energy Deputy Assistant Secretary for Infrastructure Security and Energy Restoration, chats with students as they defend mock utilities during seven hours of cyber attacks. Argonne hosts the competition each year to highlight the advantages of a career in cyber security for students and to let them test their skills in real-world scenarios, said Meridith Bruozas, who leads educational programs and outreach at Argonne. The seven-hour contest followed remarks from U.S. Representative Bill Foster (D-IL-11); Devon Streit, Deputy Assistant Secretary for Infrastructure Security and Energy Restoration in the DOE’s Office of Electricity Delivery and Energy Reliability; and John P. Quintana, Argonne’s Interim Deputy Laboratory Director for Operations. The Red Team notched several first-hour wins, briefly cutting the lights and water utilities of the Lewis University and John A. Logan College teams. As part of the ​“Pink Team” learning about cyber security, Jocelyn Murray, a student at Wakefield Memorial High School in Massachusetts, beamed as she helped the Red Team plot its attacks. “Once we analyzed the IP addresses, we chose the type of attacks based on the cyber defenders’ operating systems,” Murray said. Kwiatkowski’s Red Team also soon spotted unprotected passwords and documents hosted by the University of Northern Iowa’s team – an opening to further cyber attacks. Yet the defending teams remained optimistic. Ben Holland, a graduate student and leader of the Iowa State team, stressed that his network was working perfectly after more than an hour of defense. Despite a hectic week of preparation, ​“I had a chance to bond with my team as we had an ​‘a-ha’ moment about how to build our network,” Holland said. Like Holland, Ian Springer, a senior and leader of the Indiana Tech team, is a veteran of several cyber competitions and found the Argonne experience invaluable. ​“It’s a great opportunity to demonstrate my skills outside the classroom,” Springer said. Springer’s experience grounded his team as the terrain became tricky. In the first hour, ​“we saw a few attacks, but managed to defend against them,” he said. Throughout the day, several teams – including University of Illinois Chicago (UIC) and Dakota State University – held the Red Team at bay. Ultimately, UIC won first place as Dakota State and Kansas State shared second-place ribbons. The competition was so successful that it may need a bigger venue next year, according to Nate Evans, group lead for Argonne’s Cyber Operations Analysis and Research team, which led the event. In 2018, ​“we hope to host more teams and even coordinate teams at multiple national laboratories at the same time,” said Evans. Students and schools interested in upcoming competitions can register for updates on Argonne’s Cyber Defense Competition website.